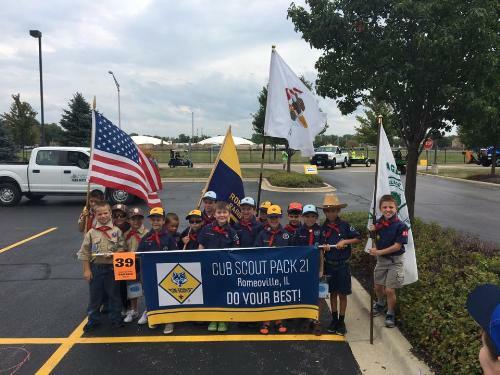 Pack 21 Romeoville, Illinois. Come and Join Us! Pack 21 in Romeoville is sponsored by Hermansen Elementary School. We meet in the cafeteria on Wednesdays, 6:30pm-7:30pm during the school year. Our pack consists of boys ages 5-11 years and entering Kindergarten-5th grade. Bobcat- This is the rank each boy begins in Scouting regardless of age and grade. Earning the Bobcat Badge signifies the boy has learned the signs, symbols and big ideas of Scouting. Arrow of Light- Boys entering 5th grade and who have earned their Webelo Badge. Boys are prepared to transition to a Boy Scout Troop. This is a very proud occasion for the boys, the pack and their families.